This L Equip Blender is a home appliance that thinks it is a commercial blender! Manufactured to the highest standards, the stylish and modern design will complement any kitchen, whether it is traditional or modern. The L’Equip RPM Counter Top Blender is definitely the best blender / smoothie maker in its class and comes with an affordable price tag. It was voted the favourite Blender by Men’s Journal Magazine so it is going to be popular with the men around the house too! This amazing piece of equipment comes with a powerful and reliable 900 watt motor. It can generate up to 20,000 rpm and a built-in RPM tachometer. The heavy duty polycarbonate jug pitcher, positions onto the base at any angle and is completely dishwasher safe. It has a 1.75 litre or seven cup capacity and a black rubber lid which is designed to be completely leakproof. When using as a smoothie maker, the Tamper stick ensures even blending withouth having to remove the lid. There is also a funnel cone for adding extra ingredients. The stainless steel, commercially designed blades can cope with just about any job you throw at them, whizzing up ice cubes and frozen fruit without any problems at all. The whole unit is encased in a brushed metal housing ensuring a sleek and modern look to this indispensable piece of kitchen equipment. In the UK, the equivalent model is the L’Equip 228 – available from Amazon.co.uk, here L’Equip 228 R.P.M. 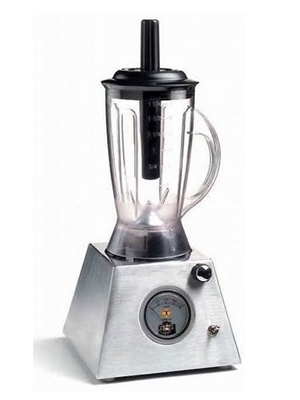 Blender or order the 30650 from Amazon.com using the link below.